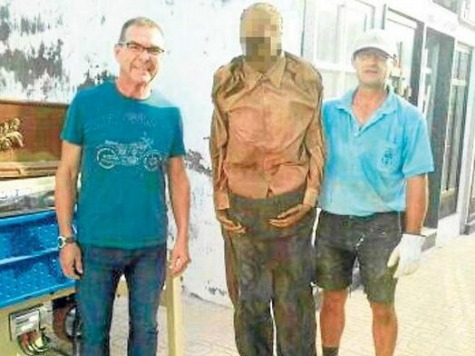 A Spanish gravedigger pictured posing next to a long-dead corpse that had been exhumed has been suspended from his duties, officials said. A municipal representative in Guardamar del Segura said the worker, identified only as Clemente, was wearing his official blue polo shirt bearing the town’s coat of arms when he appeared in a photo alongside the exhumed corpse of a man who had been dead for 23 years and another man believed to be the deceased’s nephew-in-law. Spanish daily Informacion said the photo was taken by the dead man’s niece and sent to other family members, who then posted it to social media. Officials said the corpse had been exhumed to comply with the woman’s request to have the grave extended. The civil guard is investigating the incident and Clemente has been suspended from his duties at the cemetery.